The SharkBite Connection System makes any plumbing project fast and easy with our unique push-to-connect technology. When you insert a pipe into the SharkBite quick connect fittings, the stainless steel teeth bite down and grip the pipe, while the specially formulated O-ring compresses to create the perfect watertight seal. No soldering, no clamps, no glue. Connect pipe in seconds with relative ease using the SharkBite Push-To-Connect 1/2-Inch Straight Coupling. The SharkBite plumbing fitting is the easiest way to join copper, CPVC, HDPE, or PEX pipe in any combination. With no soldering, clamps, glue required, it’s as simple as inserting the pipe into the fitting deep enough to be sealed by our specially-formulated O-ring. Once inserted, the stainless steel teeth bite down and grip the pipe. 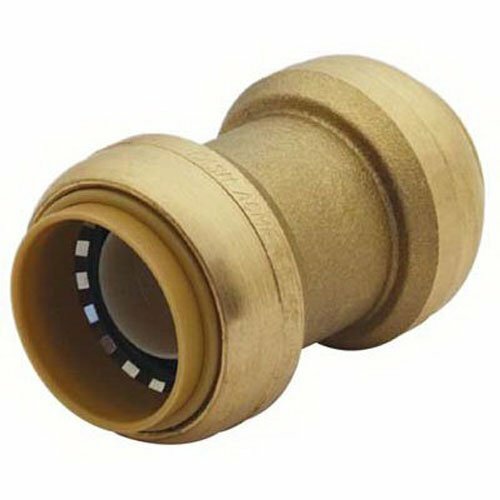 The SharkBite Straight Coupling Plumbing Fitting is designed for potable water and radiant heating (including underground or behind-the-wall) applications with no access panels required. Our product works with your existing plumbing, is easy to disassemble for changing and reusing fittings, and can be rotated for easier installation in tight spaces. Perfect for joining Copper, PEX, CPVC or PE-RT pipe, SharkBite is the no fuss way to fix small leaks or plumb a whole house. Whether you need to repair a broken pipe or plumb a whole house, SharkBite fittings are the push-to-connect solution for leak-free results. SharkBite is a provider of plumbing and water control systems for domestic, commercial and industrial applications. As the world leader and hallmark of push-to-connect plumbing solutions, our goal is to continue innovating the plumbing trade with new solutions that improve efficiency and performance. Trusted by plumbing professionals, SharkBite manufactures a wide range of plumbing fittings, water control valves and PEX pipe, making it the only total plumbing solution from meter to fixture.